Here is a slightly older Zoya, back from Fall 2011, that for some reason I hadn't gotten around to wearing until just a few months ago. Now that I've finally seen it on me, I am sure to want to wear it more often. I am sort of a sucker for blue polish, after all! 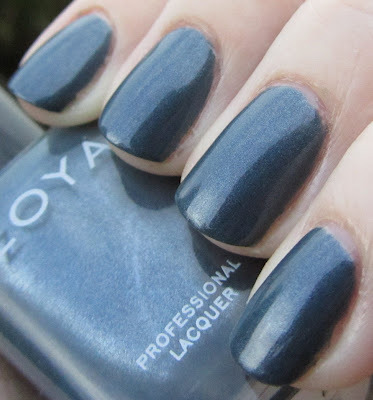 Zoya Marina is a cool-toned, smokey blue metallic. I was a little worried this one was going to have that streaky look that some metallic polishes get, but I found that it applied wonderfully. I love the dusty blue color as well as the finish. This is a blue that is work-wearable as well, which is great now that I am working with patients every day and don't really feel like I can get away with some of my favorite bright, eye-popping blues as well! I always like the look of a pretty blue mani.